“Only an alert and knowledgeable citizenry can compel the proper meshing of the huge industrial and military machinery of defense with our peaceful methods and goals.” —Dwight D. Eisenhower, farewell address of the 34th president of the United States. Television broadcast, January 17, 1961. In 1961, Dwight D. Eisenhower delivered his presidential farewell address, whose message is extremely relevant today in the light of recent revelations of massive surveillance programs, perpetual cyber/information and kinetic wars, the reshaping of the university and research complexes and intensified resource extraction. Eisenhower’s message serves as a point of departure for a set of systemic activities in the fields of communications security, data aggregation, analysis and display. 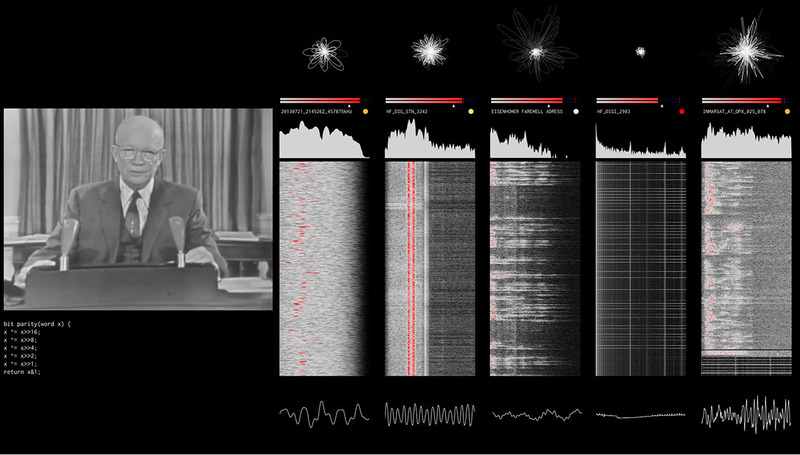 Through the use of deep learning and cognitive radio dictionaries, the current iteration of the system is trained to recognize and classify discrete digital encoding schemes and retransmit them based on the similarity of features within the speech and the audio dataset of intercepts, collected over twenty years of tactical media investigations. Embedded within this situation is also a soft probe, disrupting, and reclaiming the localized electromagnetic signal landscape. Eisenhower’s speech was not a dark forecast. The text is the foundation for a trajectory of works that reflect upon the conditions for the development of “an alert and knowledgeable citizenry” in societal circumstances that, despite constitutional protections, do not warrant them.